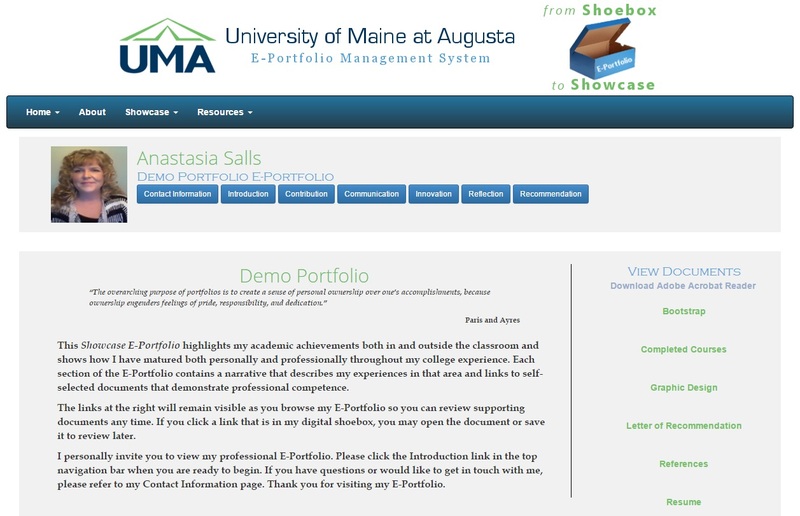 E-portfolios are the perfect way for students to showcase their experiences at the University of Maine at Augusta. With the recently launched From Shoebox to Showcase E-Portfolio Management System, UMA students now have a digital platform to demonstrate professional competence to prospective employers or internship interviewers. The E-portfolio is currently being used in specific programs where portfolios are an essential component of the program’s curriculum, including the Computer Information Systems program and specific classes that teach résumé or portfolio building. Visit the From Shoebox to Showcase site and click the Showcase link and select Showcase E-Portfolios. A page of current student E-Portfolio users displays. Click Demo Portfolio under Anastasia Salls and type: StudentDemo16! as the password. Fasten your seatbelts and prepare to be entertained as Anastasia takes you on a multi-media tour sharing her UMA experiences with text, audio, and video. For more information about the E-Portfolio, please contact Diana Kokoska at dkokoska@maine.edu or Nate Laclaire at nathaniel.laclaire@maine.edu .